Need a Dentist for your Child? Babies' first teeth erupt at about six months, so it's important to schedule a first visit to the dentist before your child's first birthday. Teething will continue until they are around three years old and adult teeth start coming in around age six. The Canadian Dental Association points out that early visits are important so potential problems are spotted early and plans made for corrections or treatment. In between visits gently clean your baby's teeth with a wet cloth and get them used to having their teeth counted and examined. My child is afraid – what should I do? Sometimes an uncomfortable visit or negative experiences as described by friends or schoolmates can instill fear. Try to keep the pre-visit mood light and don't shares fears that you yourself might have. It's also important not to speculate about treatment – leave explanations about what might or might not happen up to the dentist. In the examination room, take your cues from the dental staff. They may ask you to step back or stay within hand-holding distance. Be sure to positively reinforce courageous behaviour with a treat of some kind following a successful visit to the dentist. How often should a child visit the dentist? Get your child used to biannual visits for checkups and basic cleaning. 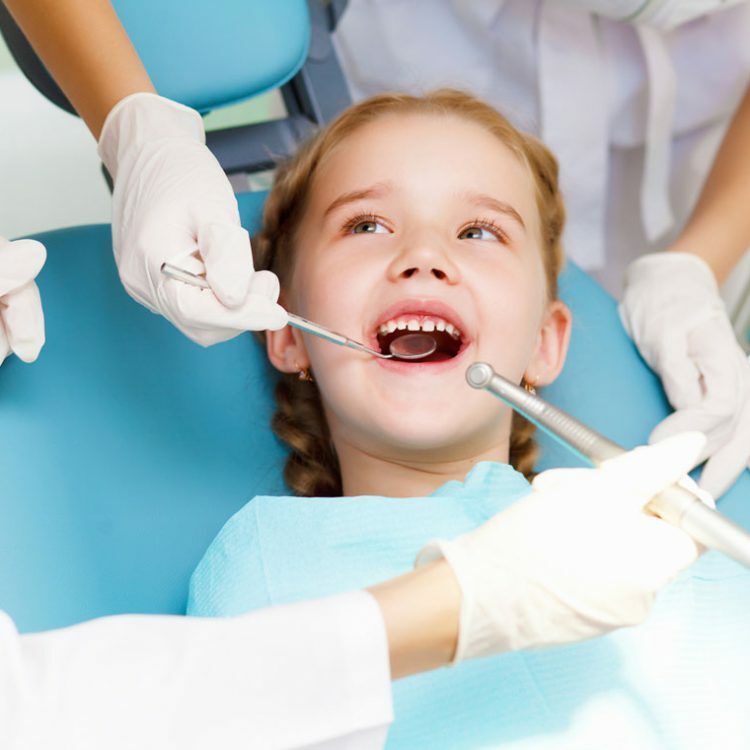 Pediatric dental staff will answer both your child's and your own questions, and teach everyone the proper way to brush teeth and, in time, floss correctly. The dentist may also recommend sealing your older child's teeth with a fluoride treatment once or twice a year to inhibit tooth decay. What happens if there's a cavity in my child's baby tooth? Even if a tooth is slated to fall out, an untreated cavity should be filled so the decay does not impact the new adult tooth that will eventually replace it. Filling the tooth is a better option than removing it should decay worsen as the empty space in your child's mouth would then need to be maintained with a retainer. A healthy routine includes brushing four times a day, after meals and at bedtime. Start children brushing very early, as soon as they have teeth. Use a soft bristle brush and avoid fluoride toothpaste until they are a bit older. What your kids eat and drink can also impact their dental health – consider limiting sugar-y drinks and candy. Looking for a pediatric dentist in Etobicoke? Get in touch and we'll get your child started on a lifetime of healthy smiles.